Dr. Stanley Shanapinda, LL.B (UNAM, Namibia); Master of Management ICT Policy and Regulation (Wits University, Johannesburg, South Africa); PhD Computer Science (UNSW Sydney). Stanley has over 15 years of experience in the communications sector. 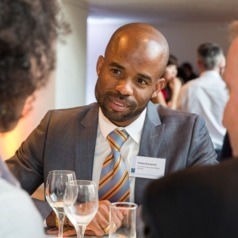 Stanley's research focuses on ICT policy and regulation; cybersecurity governance; digital transformation and digital disruption; metadata access and use for digital services, law enforcement and security; location information access and use for digital services, law enforcement and security; data protection, privacy and human rights; hybrid threats; big data; telecommunications law and policy. Chapter: ‘Habilitando a Localização de Dados para Cidades Inteligentes: Explorando os Regimes de Proteção e Retenção de Metadados no Brasil’ [trans of: Enabling Data Location for Smart Cities: Exploring the Metadata Protection and Retention Regime in Brazil], in Jhessica Reia, Pedro Augusto P. Francisco, Marina Barros and Eduardo Magrani (eds) ‘Horizonte presente: Debates de tecnologia e sociedade’ Publisher: Letramento, 2018 [trans of: Present Horizons: Debates on Technology and Society]. Regulatory Effectiveness: Stakeholder Perceptions of Namibia’s Communications Regulatory Framework, The African Journal of Information and Communication (AJIC), Issue 14. Tel Soc t/a the Telecommunications Association Inc.